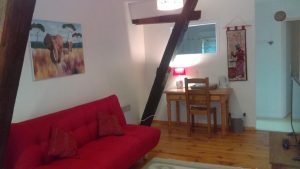 Bright and spacious, 25 m2 large, with a view to the river, this room is ready to welcome four people (there is a king-size bed and a double sofa-bed in the room). If you have a big family, there is enough space to put a fold-up bed and a baby cot. 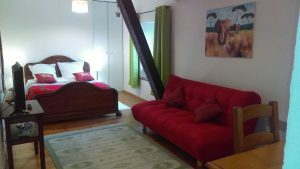 Spacious, 20 m2, with views to the surrounding fields and the terrace, our room Dalva can welcome a couple as well as a family of four. 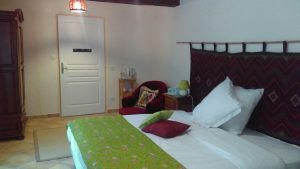 There is a double bed and a sofa (that converts, with advance notice, into a comfortable double bed for a larger family). The bathroom is spacious, with a bathtub and a shower. The toilets are separate from the bathroom. 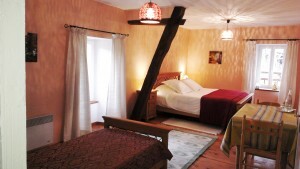 The room Gaya is 17 m2 large, south facing, with views to the garden and the mountains. There are two single beds that can be put together and make a large double bed, with enough notice. 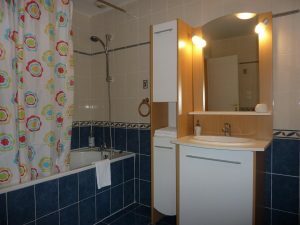 This room is suitable for people with disabilities as it is situated on the ground floor. 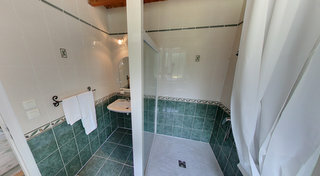 The bathroom is endowed with a walk-in shower and all the doors are large enough to allow a wheelchair to pass. 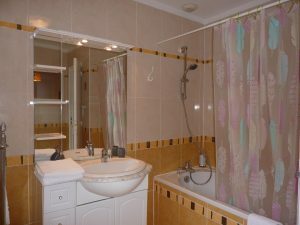 Bathroom of the room Gaya, with a walk-in shower. Please call us on +33 5 61 01 10 88 or email laciboulette-foix@outlook.com if you wish to book directly. 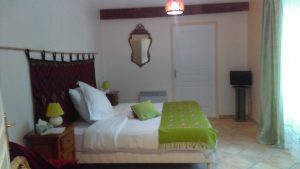 There is a discount for three or more consecutive nights spent with us.